Interview with Dr. Rupert Sheldrake about censorship of his Science Set Free lecture. Alex Tsakiris: The irony of this is, if not hilarious, certainly inescapable. A reputable Cambridge biologist publishes a book claiming science is dogmatic. He’s then censored by an anonymous scientific board. You can’t script that any better. What does this say about how science can be dogmatic without even realizing it’s dogmatic? Dr. Rupert Sheldrake: I think this whole controversy and the people who have weighed-in in favor of TED’s actions do indeed confirm what I’m saying. These dogmas are ones that most people within science don’t actually realize are dogmas. They just think they’re the truth. The point about really dogmatic people is that they don’t know that they have dogmas. Dogmas are beliefs and people who have really strong beliefs think of their beliefs as truths. They don’t actually see them as beliefs. So I think this whole controversy has actually highlighted exactly that. The other thing that is highlighted is that there are a lot of people, far more than I imagined actually, who are not taken in by these dogmas, who do want to think about them critically. One of the remarkable things about these discussions is lots of people are really up for the discussion of these dogmas. They really want it to happen, far more than I’d imagined, actually. I’m impressed by that and I think this TED debate has actually helped show that the paradigm is shifting. There’s no longer a kind of automatic agreement by the great majority of people to dogmatic assertions by scientific materialists. 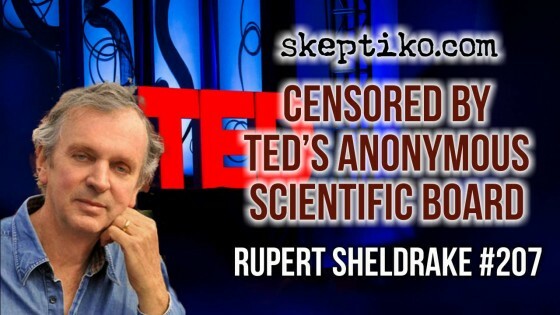 Today we welcome Dr. Rupert Sheldrake back to Skeptiko. 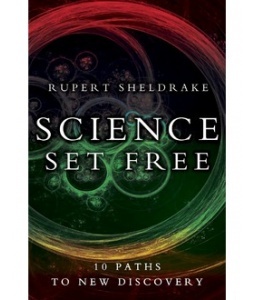 Many of you know the work of Cambridge biologist, Dr. Rupert Sheldrake, including his latest book, Science Set Free. But now you may have heard that this book has seemed to have struck quite a nerve because Dr. Sheldrake has found himself in the middle of a controversy surrounding the censorship of a video lecture that he presented and that was then posted on the very popular TEDx YouTube channel. It was then removed after—and get this—an anonymous scientific board deemed it unscientific. Rupert, welcome back to Skeptiko. Thanks for joining us. Tell us what’s happened here. Dr. Rupert Sheldrake: Well, you summarized it more-or-less. I gave a talk at the TEDx series of talks in London in Whitechapel. The organizers were young women, students at London University, who organized a very lively event. It was called Challenging Existing Paradigms. They asked me to talk about challenging existing paradigms, which seemed just the right theme for my book, Science Set Free. So I did a TEDx talk for it. It was extremely popular; the event was sold out. There was a lot of lively discussion that was really fun. It went up on the TEDx website, as these TEDx talks often do, and all was well until it was denounced by two of America’s leading militant skeptics, PZ Myers and Jerry Coyne, who didn’t like it because it upset their rather dogmatic materialist worldview. So they called for it to be taken down and they said it discredited itself, etc. They put enormous pressure on TED and then they got armies of their supporters to send emails to TED and put comments on websites. So the TED people backed down. They removed it. Then having removed it, they had to justify removing it so they had this report from their so-called “scientific board,” an anonymous board. I don’t know if it includes PZ Myers or people like that. We don’t know who it includes. They wouldn’t reveal it. And they took it down. It’s not exactly censorship, as they insist on pointing out. They put it with a kind of health warning. It was still there but it had been put in a kind of Naughty Corner of the Internet, not on the main TED site. That started off a very big controversy and I replied to the accusations of their science board, one by one. They were very easy to refute. But then the thing spiraled out of control and a huge controversy blew up all over the Internet, with lots of people taking it up on Facebook and blogs. Things were going pretty badly for TED. I then had a call about a week ago from Chris Anderson himself, the head of TED. He was obviously really worried about this and was trying to calm the situation down, which they’ve now done by putting my talk on a separate blog, separate from the other one they took down, by Graham Hancock. He said it was a debate and had people put comments online, the great majority of which supported my talk and not the actions of TED or the very intemperate and emotional–and I have to say–unintelligent remarks of Jerry Coyne and PZ Myers. Alex Tsakiris: Right. As you mentioned, Chris Anderson is the founder and the head idea-spreader, if you will, at TED. It’s nice to know that he’s connected with you personally. I would have loved to have had Mr. Anderson or any of his scientific advisors on Skeptiko. I think it would have been quite a debate. Really not much of one because as you alluded to, to anyone who reads your point-by-point counter to their claims, it’s pretty one-sided. I think most of the commenters on the TED website would agree with that. What I thought we might do today is to give folks a little sense for the spirit of this discussion and, in a broader sense, this controversy that you bring up in your book, Science Set Free, about whether or not science is dogmatic. Whether or not science can get itself out of this rut it’s in. What I thought we might use as a vehicle for that is for me to play the role of Chris Anderson and use some of the words and ideas that he spread on his blog about this controversy and get a response from you. Does that sound like something we might be able to do? Dr. Rupert Sheldrake: Yes, okay. Alex Tsakiris: So let’s start with this one. First off, Dr. Sheldrake, you’ve got to appreciate the position that TED is in. I mean, the TED conference, TEDx, these are important worldwide brands. We’re the ideas worth spreading to people and we have to make sure that the ideas on our site are really worth spreading. To that end—I’m going to have a hard time keeping a straight face on this—one of the hardest lines for us to draw is this line between science and pseudo-science. At TED, let me tell you, we’re committed to science but we think of it as a process, not as a locked-in body of truth. I want you to know that. But some speakers, as you know, will use the language of science to promote views that are incompatible with all reasonable understanding of the world and giving them a platform is counterproductive. So, Dr. Sheldrake, you have to understand our position here. I mean, we do have to look into these ideas that are presented on our website. Dr. Rupert Sheldrake: I do see Chris Anderson’s point of view and indeed, I had a long conversation with Chris Anderson on the telephone. We got on perfectly well. I wasn’t particularly angry with him or anything like that. It was a reasonable conversation. They do have a point. There’s a lot of rubbish and there has to be some kind of filter. So I’m not against the idea of a filter but what I am against is the idea of applying the filter in a very partial kind of way. There are lots of things up on the TEDx website which are controversial. For example, there are a lot of talks by militant Atheists which a lot of people find controversial. A lot of people disagree with what they say and think they’re actually wrong in a variety of ways. But those haven’t been flagged up or put in the Naughty Corner. Those have been allowed absolutely free run on the Internet. They’re put up on the main website, talks by people like Richard Dawkins, for example. The difference here is that my talk was flagged up as being pseudo-scientific because Jerry Coyne didn’t like it. Well, Jerry Coyne is a very bigoted man who writes very loud-mouthed things on his website. I don’t take him very seriously. I mean, he’s a polemicist, a kind of Dawkins-type polemicist. So they pay a lot of attention to what Jerry Coyne and PZ Myers said on their websites. If there had been a similar attack by, for example, Christian Fundamentalists on Dawkins they would have ignored it. But if it’s by scientific fundamentalists then they pay attention, and what’s more don’t just pay attention but dig themselves into a hole trying to justify this. So I think the problem here is an attempt to filter out content was done in an extremely biased way. If every TED talk which is controversial was flagged up by somebody who didn’t like it and put in the Naughty Corner, all the most interesting talks would be in the Naughty Corner. Only the dullest would be on the main website. What’s more, TED in their instructions to the organizers of the TEDx events told them they wanted controversial talks. They said controversy energizes. When it’s in a particular area, one that upsets the dogmatic materialists, then they back down and say it’s not the right thing to have. So I think that it’s been inconsistent. They’ve paid far too much attention to these very biased and I think minority and strident voices. Alex Tsakiris: Yeah, but see Dr. Sheldrake, that’s not the case because when they went to their scientific board, the majority of them agreed that your and Graham Hancock’s videos should be removed from circulation. Didn’t they do the right thing? They went to their anonymous scientific board. Dr. Rupert Sheldrake: We don’t know who the scientific board are so we don’t know if it’s the right thing. If we look at the TED board of advisors, the brain trust for TED as they’re called on the website, the main people in the area of consciousness studies are Steven Pinker and Daniel Dennett, both of whom are extreme militant Atheists and materialists. So we just don’t know what kind of people are on the scientific board and we don’t know how many are consulted. Is the majority two out of two? Or is it 20 out of 30 or something? We don’t know. I imagine it was just one or two phone calls. Alex Tsakiris: You have to acknowledge that these folks have to remain anonymous, right? I mean, they’re a scientific board. They have to be anonymous for obvious reasons. I gave the talk at their invitation, after all. I didn’t get paid for it and I fulfilled all the criteria of contradicting existing paradigms and so forth. Anyway, I think this is a very unreasonable objection and I think that the science board should be named. After all, he said the analogy was a peer review in journals. In peer review in journals, the peer reviewers are anonymous but so are the people whose papers they’re reviewing. The authors are removed from the papers that are submitted to peer reviewers. The whole thing is anonymous. The editor of the journal who makes the decisions is not anonymous. You can look up the editorial board of any scientific journal and their names are given there. So you know who’s ultimately responsible. In this case, you don’t. So it’s very hard to know whether the scientific board even exists or how credible they are. And if they’re requiring scientific credibility then we do need to know who they are. They might just be flakey Coyne-ites or Myers-ites. Alex Tsakiris: Finally, let me hit you with one more point that the TED people make. TED and TEDx are brands that are trusted in schools and homes. They don’t want to hear from some parent whose kid went off to South America to drink Ayahuasca because TED said it was okay. I mean, Dr. Sheldrake, think of the children. Or for that matter, some kid who winds up going to school thinking that telepathy is real or that consciousness extends beyond the brain. We don’t want that. There’s a limit to how far you can push an idea until it reaches a point where it’s no longer worth spreading, wouldn’t you agree? Dr. Rupert Sheldrake: Well, I agree. Some ideas are not worth spreading. I do agree with that. But exactly how you make the criterion is another question. This sudden concern for children seems to me rather misplaced. There are already quite a few talks about psychedelics on the TED website and there is no objection to those apparently except for a recent one by Graham Hancock. So I don’t think this is a consistent objection about children. The other thing is TED recently sent around a guideline to TEDx organizers, telling them how to tell science from pseudo-science. It’s rather an interesting document. What it says is how to tell genuine science is basically genuine science is what’s being done by quite a lot of people in universities, approved and published in leading peer-reviewed journals and if you’re in doubt call up a professor at your local university and ask him about it. If it’s pseudo-science or if it’s not genuine science he’ll tell you. That would be a perfect way of eliminating anything to do with parapsychology from the TED talks. And also, several people pointed out on their blogs that it would also have eliminated Albert Einstein because only people holding academic posts should be considered to be real scientists. Einstein was a clerk in the patent’s office when his great papers on quantum theory and relativity were published in 1905. Charles Darwin never had an academic post. Darwin would have been classified as pseudo-science straight away on the TED criteria. So they’ve made a rash decision hurriedly and they’re trying to justify it, and the more they try to justify it the more difficult their position becomes. And also, if they want to protect children then why not protect them from some of the militant Atheists who may have a very disturbing effect on the children’s thinking? So I think that the whole attempt is actually one where TED has done themselves quite a lot of harm by taking an irrational decision and then trying to justify it in a way that is pretty unconvincing. I mean, I sympathize with them and indeed, when I talked with Chris Anderson I sympathized with him. I wouldn’t like to be an editor of a series like that because there are people who are borderline cases. You do have to draw lines somewhere. I’m not against drawing lines; I think they have to be drawn. I just think they’ve handled it pretty badly. Alex Tsakiris: So let me switch out of the mode of trying to put forth the TED ideas as much as I can glean them from their numerous blog posts and website comments. Let me ask you a couple of questions in general about this because the irony of this is, if not hilarious it’s certainly inescapable. I mean, a reputable scientist like yourself publishes a book claiming that science is dogmatic and then is censored by an anonymous scientific board. It’s like you can’t script that any better. What does this say about really the whole topic of your book? And about how science can be dogmatic without even realizing it’s dogmatic? Dr. Rupert Sheldrake: I think in a way this whole controversy and the people who have weighed in in favor of TED’s actions do indeed confirm what I’m saying. These dogmas are ones that most people within science don’t actually realize are dogmas. They just think they’re the truth. The point about really dogmatic people is that they don’t know that they have dogmas. Dogmas are beliefs and people who have really strong beliefs think of their beliefs as truth. They don’t actually see them as beliefs. So I think this whole controversy has actually highlighted exactly that. The other thing that is highlighted is that there are a lot of people, far more than I imagined actually, who are not taken in by these dogmas, who do want to think about them critically. One of the remarkable things about these discussions is lots of people are really up for the discussion of these dogmas. They really want it to happen, far more than I’d imagined, actually. I’m impressed by that and I think this TED debate has actually helped show that the paradigm is shifting. There’s no longer a kind of automatic agreement by the great majority of people to dogmatic assertions by materialists. Alex Tsakiris: It’s almost as if this is somewhat of a marker of the kind of events that would happen in the process of changing a paradigm. Dr. Rupert Sheldrake: Yes. This is actually, to me, an illustration of actually seeing a paradigm shift in action. I think this controversy wouldn’t have been a controversy after all if a lot of people hadn’t thought that TED had made the wrong decision. There wouldn’t have been large amounts of thousands of comments on blogs all over the Internet. That wouldn’t have happened if the majority thought TED had made the right decision and it was more-or-less a done deal that materialism is the only acceptable form of science. Now, I think the fact that so many people strongly about it is why there’s been a controversy and I do think we’re actually seeing a shift. Also on these various blogs and discussion forums now and then one of these standard skeptic voices comes up with all the standard arguments that we’ve all heard hundreds of times before but now they’re being shot down by people who are saying, “Okay, where’s your evidence?” and calling them on things which normally they’d get away with. That, too, is a change. It’s a kind of empowerment of people to challenge this dogmatic materialism. Alex Tsakiris: And maybe in a way Chris Anderson has unwittingly done you a favor and done this cause, if you will—I hate to say it that way—but has done certainly your book a favor in drawing contention to your ideas. Do you think that might be true? Dr. Rupert Sheldrake: I think it is, actually. I don’t think he’s done it on purpose and I don’t have any personal grudge against Chris Anderson. When I talked to him I found him a perfectly reasonable chap and I enjoyed our conversation. Alex Tsakiris: But Rupert, he does seem incredibly unaware of the situation as it exists. I mean, even when he tries to recover and says, “Okay, I understand consciousness is controversial,” he has such a kindergarten appreciation for the issues that really are at hand and the controversy that really lies at the core of that issue of are we these biological robots that are purely a product of our brain or not? It’s going to take him a lot of education to get where he could have an intelligent discussion about these issues, no? Dr. Rupert Sheldrake: I think he’s personally quite interested. He studied philosophy at Oxford. He told me and I think it’s probably true that he’s always been interested in the nature of consciousness so he probably is. I didn’t think he was making it up. I thought he was sincere. I think he is a bit behind. He’s surrounded himself with the kind of materialist establishment. If you look at his board of advisors, many of them are people who do have this very limited mechanistic view of consciousness. So I think he’s living in a kind of mainstream world where he only gets to hear a rather limited range of opinions. I think this controversy has made him aware that there are a lot more voices out there and a lot of people who don’t think in that way. I think it’s probably a steep learning curve he’s on because he obviously was very naïve to start with and he’s realizing that actually a lot of people think differently. Alex Tsakiris: Right. Well, Dr. Sheldrake, we’ll keep an eye on this issue and report to people if anything new happens. Other than that, can you tell us briefly what’s going on with you and upcoming presentations you might have or anything else that’s in the works? Dr. Rupert Sheldrake: I’m doing various presentations in Europe and in Britain about my books, The Science Delusion and Science Set Free. The details are on my schedule. I’m doing a program in Dublin, Ireland on science and spirituality in April. Again, that’s on my schedule. That’s happening at Christ Church Cathedral. I’m doing it with the Dean of Christ Church. I haven’t met him yet but I’m looking forward to that because I think that would be a chance for a dialogue in a relatively orthodox spiritual setting and to see how these new ideas in science play out in that kind of dialogue. In the summer much further ahead, I’m doing a program at Hollyhock in British Columbia in Canada in the end of July, beginning of August. It’s a remote and beautiful island where I go every summer with my family. This time, for the first time I’m doing it with my two sons, Merlin and Cosmo. Cosmo’s an anthropologist and musician and Merlin is tropical ecologist. He’s doing a Ph.D. on tropic ecology in Panama. He’s a Smithsonian Research Fellow and he’s in England now but is just about to go back to the jungle. We’re doing called “Plants, Minds, and Resonances.” They’re both musicians and we have lively discussions at home. It’s the first time we’ve ever done something together. So I know it’s going to be fun for us. I hope it will be fun for others, too. So anyone who’s interested in going to something where no one knows where it’s going to lead, it’s almost certain to be fun. That would be a good place to go. And then I’m doing a workshop in September with Marc Andrus, who’s the Bishop of California at the Esalen Institute in Big Sur. Again, that will be something that will go where these discussions don’t normally go. It will be with a remarkably open-minded bishop, but a bishop all the same in California. It’s on his patch. Again, what we’re going to be doing is looking at morphic resonance and holistic thinking in relation to spiritual practices. Not spiritual dogmas but spiritual practices. The things people actually do like pilgrimages and prayers and mantras and chanting and ceremonies and rituals. So those are some of the things coming up ahead. Meanwhile, my main activity, as always, is research. I’ve got various research projects afoot at the moment, particularly ones on morphic resonance, which I’m planning in several laboratories in different parts of the world and engaged in discussing them with the scientists I’ll be collaborating with. So more on that later. I don’t want to talk too much about this now because they’re in the planning stage still and we hope to get them started within the next few months or even weeks. Alex Tsakiris: Excellent. We’ll certainly look forward to hearing more about that as it unfolds. It sounds like you have some great forums in which people can meet you and see these ideas take life. Anyone who’s interested, I’m sure they’ll check out your website and find you there. Dr. Sheldrake, thanks for coming on and talking about this interesting little controversy that has brewed. Thanks again for joining me. Dr. Rupert Sheldrake: Always a pleasure, Alex.